Once you’re logged in and on the desktop, the temptation will be to start playing with your new toy right away. Don’t. Despite being fresh out of the box, there will be updates and drivers that need to be installed. If you don’t do the updates up front, you will notice a lot of laggy performance for the first week as the operating system tries to do everything silently in the background. Updates may take an hour or more depending on your connection speed, but the investment will be worth it if you can more quickly run your device at full speed without unexpected background activity. The All Settings button is accessed by tapping the Notifications icon, located in the far lower right of the taskbar. You can also access these options by tapping the Windows button and on your keyboard or tablet and typing ‘settings’ and hitting enter. 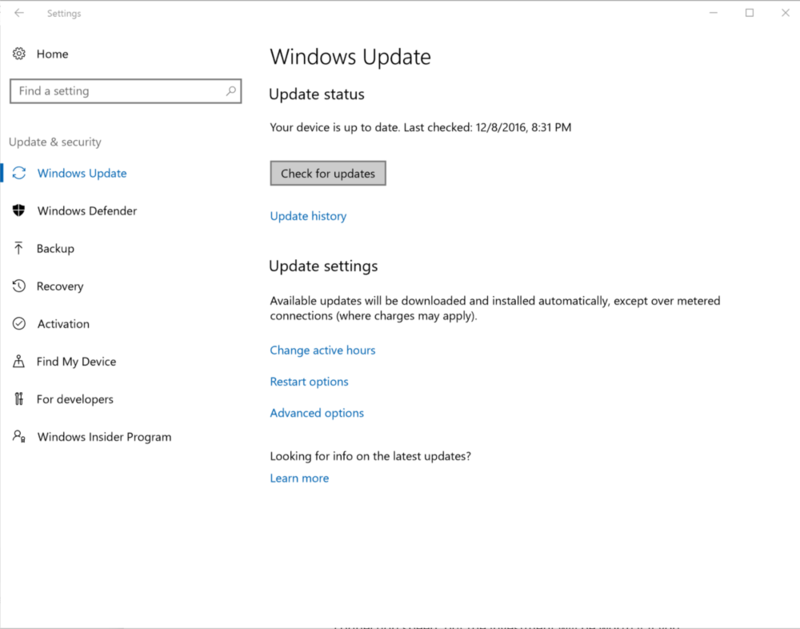 To access Windows Update, go to All Settings>>Updates & Security>>Windows Update. Tap Check for Updates. After your machine installs the first batch, perhaps ending with a reboot, don’t assume it’s done with updates. Go through the process as many times as necessary. Even if the system tells you it’s up to date, tap the check for updates again until the system searches and confirms that no updates are remaining. Sometimes, an update will appear to get stuck or fail to install. There are many reasons for this, but one of the simplest is that a reboot is required before something else can be installed. Check the Power button to see if you need to Restart and install.